Jamaica is an island located in the Caribbean Sea. Despite its small size, it is internationally recognised for its warm hospitality, food, culture and music. Here are a few things to love about Jamaica. This is Jamaica’s delicious national dish. 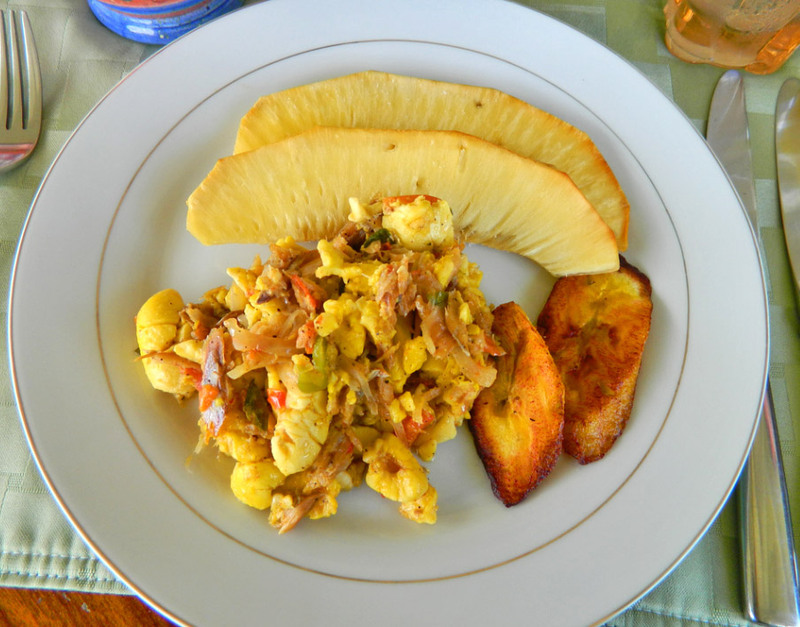 The fruit ackee is commonly served with cod fish (salt fish) served over roasted breadfruit, rice or bread. You can also have it with some roasted plantain if you fancy. Dunn’s River Falls is a famous waterfall and one of Jamaica's natural treasures. The waterfall receives thousands tourists and visitors each year. The waterfalls are terraced like giant natural stairs which can be walked on but it is usually advised to do this in groups. Jamaica is the birthplace of Reggae music which was developed in the 1960s. It is a very rhythmic form of music that has several sub genres such as dancehall, rocksteady, lovers rock and dub. Bob Marley & The Wailers were the most iconic reggae band in history. It you enjoy going to markets then you must go to Coronation Market. It is a huge market located in Kingston offering a wonderful feast of sights, smells and sounds. So many different fruits and vegetables are available to buy. It is here that you get a sense of Jamaican life. Jamaica’s Blue Mountain Coffee, grown in the Blue Mountains of Jamaica is one of the most sought after coffees in the world. The Blue Mountain Coffee beans are the flavour base of Tia Maria coffee liqueur. Did you know that almost 80% of Blue Mountain Coffee is exported to Japan? Devon House mansion is one of Jamaica’s heritage sites. It was home of Jamaica’s first millionaire, George Stiebel. The property was built in 1891, on what was originally a former plantation property. It is ranked by the National Geographic Magazine as one of the top five places to eat ice cream in the world. Jamaica is blessed with white sandy beaches and clear water on every side of the island. During the holidays, Jamaicans flock to the beach to either enjoy a splash with friends and family. Posted on August 6, 2015 by Adamu Waziri and filed under Useful Lists, Fun Stuff.